My daughter Ravenna was only six-months old when I got my first real food job, as a pastry chef at Beardsley’s in Northampton, MA. After a while there I went on to Bread & Circus, a Whole Foods precursor, and after that to the small, all-scratch Black Sheep Deli & Bakery in Amherst. She was constantly around food, hearing about it, smelling it and tasting it. She was as adventurous as I was as a child, and I enjoyed her open palate. When she turned three, she was registered to attend her first pre-school. This, I reasoned, would be her first day of at least fifteen years of schooling and I was going to set her up right. I would set the bar appropriately for a child of a food savvy Mom. I would make an impression on my daughter, showing her how boxed lunches could be delectable and healthy. No one else’s child would have a lunch like my Ravenna. I thought I was being smart by planning dinner the night before her first day to yield the perfect leftover foods for the packaged lunch. I decided that a meal of classic and authentic Chinese foods would be the way to go. Don’t ask me what I was thinking; I wasn’t! I sautéed ground pork and combined it with scallions and sesame oil and made Chinese dumplings, which I pan sautéed. 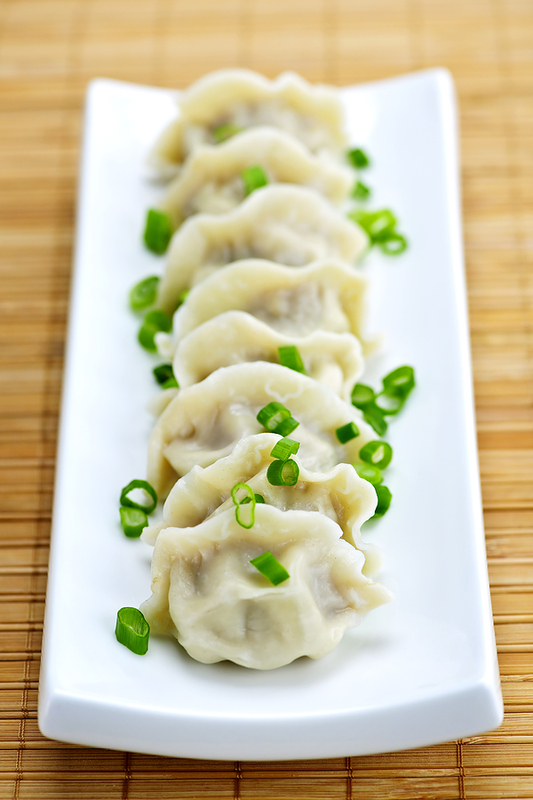 I was a little sheepish about the fact that I used pre-made dumpling wrappers, but I wouldn’t be telling anyone. For the bulk of her meal she would enjoy the leftovers of plump shrimp, marinated in naturally brewed soy sauce, sherry, garlic and ginger, sautéed in oil and thickened with a bit of cornstarch. Peapods were thrown in for color and crunch and I would not refrigerate the rice overnight. There is nothing worse than refrigerated rice. The next morning I got Ravenna and her lunch ready, drove her to school and left her with her fancy schmancy lunchbox. My daughter says she has absolutely no memory of this whatsoever. This is probably because I so overdid it that first day, that I didn’t even try after that. I fell flat on my face, due to no one’s idiocy but my own. In fact, I did both of us a disservice by overshooting so far that first day, that all I could do was fall way down after. I wonder what she will make for her child’s first packed lunch? Ravenna is a food person too, but she is much smarter than I. May I suggest a simple cheese sandwich or PB&J?